Camille Claudet, an emotionally unbalanced young woman, had a tumultuous relationship with the famous sculptor Rodin. Like Rodin, Camille expressed intense emotion in her sculptures. Her creations provided an outlet for the boiling turmoil within. Heather Webb’s emotionally charged novel and rich language mirror Camille Claudet’s talent as a sculptor. With words as her medium, Webb reflects Camille’s ability to express passion and the inner world of humanity through marble and bronze. From early childhood, the desire to sculpt drives Camille in a way that foreshadows her later madness. Her father supports this deep-seated need and provides art tutors for her. Her mother, an emotionally distant and straitlaced woman who has never recovered from the loss of a baby son, can neither love her daughter nor accept her unconventional role as a sculptor. By the time Rodin becomes Camille’s tutor she already reveals great skill. But she is a woman, and the world of Belle Époque Paris is not ready for expressions of passion and raw emotion from female hands. Camille struggles to gain approval and commissions. As Rodin’s lover, she is often dismissed and her work’s inspiration denigrated as coming from him, a second-class status, no matter how little this reflects the truth. Envy of Rodin’s brilliant career eats at Camille as does his unwillingness to leave the woman he has lived with for years even though he has ceased to be the woman’s lover. Rodin and Camille love each other in an all-consuming but destructive passion that entraps them both while simultaneously driving a wedge between them—all the more so as Camille’s unstable mental state spirals out of control. Webb’s dramatic portrayal of these intertwined lives brings us inside the artistic psyche, the sources of their inspiration, and shows us why neither can maintain an entirely balanced and “normal” existence. But from such emotional turmoil, often self-inflicted, arises their ability to put pure emotion into solid form. Webb expertly captures the way that both Rodin and Camille view the world—emotions in concrete expression. One evening at an opulent birthday celebration for Victor Hugo, Rodin studies the waiters as they serve the guests. “Auguste enjoyed watching them, their smooth expressions a thin veil that did not disguise their disgust for the wealthy, or perhaps a desperate longing to be like them. He studied the wrinkled hands of an attendant, saturated with fatigue, and the hump in his back. He found no pride in his work, but burden.” Webb gives us both the sculpted vision and the inner understanding of the sculptor arising from his work. Webb puts Rodin’s emotions into a small physical gesture, just as a sculptor would, the shifting of weight into the heals and then the nature of her gaze. 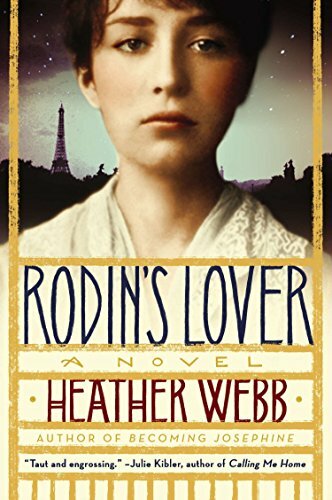 Webb saturates her language with the kind of overwhelming sensation that provides the source of Rodin’s and Camille’s artistic vision—but also their daily emotional instability. These two people, Camille more disastrously than Rodin, feel and experience passion to such a vivid and disproportional extent that they can represent it in concrete form, but at a great inner cost. Webb also traces Camille’s descent into increasing emotional instability with great delicacy and skill. Camille’s mother cannot touch her oldest daughter nor show any love. Her father attempts to make up for this coldness with kindness but he does nothing to change his wife’s bizarre behavior. Thus we see an early source of trouble. Later this voice will say bizarre and harmful things that we know are a sign of madness, but here we are not sure. There is a sort of logic and sensibility to this warning to pull away from Rodin’s embraces. On one level she would be wise to resist, to build a career without the burden of being seen as “only” his lover. We worry about Camille and we should, but there is hope in this passion of Rodin and Camille. They offer each other the kind of shelter only two people who genuinely understand each other can. Webb shows this interplay of influence throughout their relationship. We understand this as a relationship of artistic equals. In portraying the conventionality of Camille’s mother and her mania for marrying off her daughter to a “proper” gentleman, Webb introduces the fictional courtship of Alphonse Bertillion, an actual policeman and criminologist of the time. Camille slips out of the house when Bertillion comes to call, insulting him and enraging her mother, a measure of her willingness to oppose her family and act in unconventional ways. This fictional use of Bertillion serves a useful purpose, but his later, entirely coincidental (and also fictional) entrance feels contrived. The woman Rodin lived with throughout his adult life did shoot at Camille and was restrained by a policeman, but not by Bertillion. Bertillion’s presence allows the reader to see this reminder of the other path Camille could have taken at a moment when her life tips toward a precarious emotional descent when Rodin chooses, in her view, the “other” woman over her. Bertillion thus serves a thematic purpose, but his sudden appearance out of nowhere with minimal explanation startles the reader momentarily out of the power of this violent scene. It’s a small thing within only one scene, however, and does not diminish the emotional force of this novel. Rodin’s Lover takes the reader inside the minds of two brilliant artists with great clarity of understanding and does so by using the language of sculpting so that we feel intimately connected to these remarkable people. The interplay between love and the creative process is explored in a sophisticated and nuanced manner that makes this novel as enjoyable to experience as Rodin’s and Camille’s sculpture. Judith Starkston is the author of historical fiction set in Troy and the Hittite Empire. She contributed a story to SoWest: Desert Justice, an anthology cited by Suspense magazine as among the "Best Books of 2012." Her debut novel Hand of Fire will be published by Fireship Press in 2014. Ms. Starkston has also taught high school English, Latin, and the humanities for 24 years.